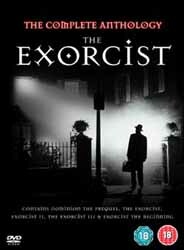 The Complete Anthology is a box set containing all five instalments in The Exorcist series of films. The movies are listed and packaged in chronological order, so that the original effectively becomes the third here. As I have previously reviewed each of the DVD releases separately, it falls to me to tell you a little about what you're purchasing. For more detailed information see my reviews for The Exorcist Trilogy Box Set, Exorcist: The Beginning, and Dominion - Prequel to The Exorcist. But here's a brief guide to each of the films. Dominion - The Prequel follows a younger Father Merrin who has lost his faith after an incident during the war. On an archaeological dig in East Africa he uncovers an ancient Christian church. But the structure had been buried for a reason, and now an age-old evil is free to escape. Merrin must rediscover his faith to confront the entity. The best of the bunch aside from The Exorcist itself. Exorcist: The Beginning is essentially the same script as Dominion but with an inferior and less subtle approach. This more violent version was favoured with a theatrical release, but when box office takings proved disappointing, Dominion (the better film in the first place) was rushed straight to DVD. Nevertheless, The Beginning is not as woeful an event as many critics would have you believe, it simply is not fit to wear The Exorcist name. The Exorcist, the original William Friedkin film, is pretty much faultless as a pristine slice of cinematic history. It stands the test of time well, and you still feel slightly uneasy watching it today, due to its almost documentary feel. In other words, it doesn't seem like fiction at all. Father Merrin attempts to cast out the evil from a demon-possessed girl. The Fear of God documentary is a fascinating discussion of on- and offset events. Exorcist II - The Heretic, John Boorman's sequel, has Father Lamont investigating what happened to Merrin, while the child Regan is having her nightmares studied. An unnecessarily complicated story involving the cult of locusts, which relies heavily on back story and then tries to make-up for it with a few special effects. Not a bad film, but leagues below its predecessor. The Exorcist III has The Exorcist writer William Peter Blatty returning to the fold to both write and direct this sequel which is set immediately after The Exorcist. Lt. Kinderman investigates a series of religious killings. This is quite a good film, well acted, and very different from the others. However, it does get messy at the end when explanations are obliged to tie events in with the previous movies. For any Exorcist nut this is an essential purchase, if you don't already have them from previous retail releases. For anyone simply curious about the near perfection that is The Exorcist, I would advise them to buy that film alone, purely for the sake of cutting costs.